The Staples Center complex in downtown Los Angeles is impressive. 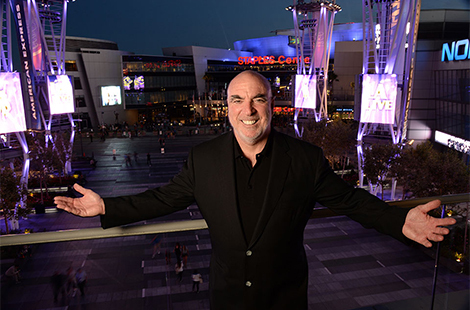 Somewhere in or underneath one of those buildings, you’d find CSUN alumnus and Staples Center President Lee Zeidman making sure all runs well. Read more about Zeidman. The San Fernando Observatory is being moved to CSUN, where students and faculty will find it easier to access the facility to monitor the sun’s radiation as it nourishes the earth. Read more about the observatory. The world’s coral reefs may survive the effects of an increasingly warmer planet, but not in a state that most people would recognize, according to a new study by CSUN’s Peter Edmunds. Read more about coral reefs. Thur., Oct. 9, 7 p.m.
Fri., Oct. 10, 8 p.m. The CSU is celebrating reaching 3 million alumni worldwide. CSUN alumni are encouraged to join the online yearbook today and claim their spot in the class of 3 million. CSUN theater students will be touring San Fernando Valley middle and high schools this fall with a play that bridges Greek mythology with contemporary times to explore the challenges of being a teenager in today’s world. CSUN will celebrate the 45th anniversary of the founding of its Department of Chicana/o Studies with a benefit concert.